A sorting by folder is activated for some views. If you want to sort your e-mail by date, you can deactivate the sorting by folder. 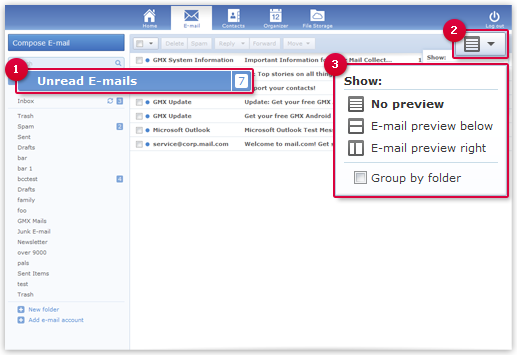 In the Unread e-mail and Favorites views, as well as in the search results, your e-mail are sorted by folder. You can deactivate sorting by folder. Open the Unread e-mail or Favorites view, or enter a search term and click the magnifying glass icon. Click the Change view button. Remove the checkmark next to Group by folder. In the Unread e-mail and Favorites views, as well as in the search results, your e-mail are sorted by date.